A/N I&apos;m so sorry if I made some people confused in the last chapter. But let me get this clear now; Draco is NOT dead. Hermione only dreamed it. Hermione had asked Narcissa and Lucius if she could go and see Ron and Harry they had agreed. They were now sitting in the sofa they had in the living room.
" How is it going?" Harry asked when he served her some tea. " I don&apos;t why, but when I woke up today, I felt stronger "
Both Ron and Harry raised their eyebrows. " Stronger?" Ron said with a confused tone.
" Haven&apos;t you ever felt so weak and helpless that you can&apos;t even get out your bed sometimes?" Harry nodded and so did Ron after a moment. " We all had sometimes " Harry replied.
" But today I woke up with so much...I don&apos;t know, power! And I felt so strong again. Like nothing in the world could hurt me. You know what I mean?" " Yeah..." Ron and Harry said slowly. They didn&apos;t really dare to say no.
" And I just feel that I can do anything! I think I&apos;m going out running today"
Hermione couldn&apos;t sit still anymore, she flew up from the couch and put down the cup of tea. She ran out from the house and all the way down to her own house.
" What is going on inside her head, Ron?" Harry asked when they saw she was inside her house.
" A lot of things" Ron replied. After a long tour outside Hermione took a shower and watched some tv. She was sure that Narcissa or Lucius would start to look for her soon, but in that moment she didn&apos;t really care. She started to have a mentally dialogue with herself.
" Where on earth can he actually be?" She said out loud. Her inner godess only shrugged. &apos; There&apos;s no one who knows&apos; She said.
" If he didn&apos;t tell someone...someone he truly trusted" Hermione said. As fast as she got there, she ran to Ginny&apos;s room, and kicked the door open. There she found Blaise and Ginny, they were reading the Daily Prophet but were still in each others arms.
" Blaise Zabini!" Hermione said angrily. Blaise Held up his hands in defence. " Hermione Granger?" " It&apos;s you" she said and gave a him a death glare.
" I&apos;m you now?" Blaise said confused.
" Hermione calm down what is it?" Ginny said nervously.
" Back off Ginny, I need to talk with your boyfriend"
" Why?" Blaise said. " Is it because I stole your snacks from your muggle home? I can buy you another bag if you want?" " What? No, it&apos;s about Draco" She pointed her wand at the dark wizard and narrowed her eyes.
" Tell me everything you know"
" I don&apos;t know anything, I swear" Blaise said.
" You are the only living human being Draco would trust his life with..."
" Don&apos;t forget yourself there" Blaise said and looked at the wand that was pointed right into his face.
" But he would only tell YOU about where he was going, right? So tell me. Now. " " I promised him not to" Blaise said  without any hesitation.
" Why? Why can&apos;t I know?!" Hermione yelled.
" No one can. Except me"
" But...but....ah forget it! 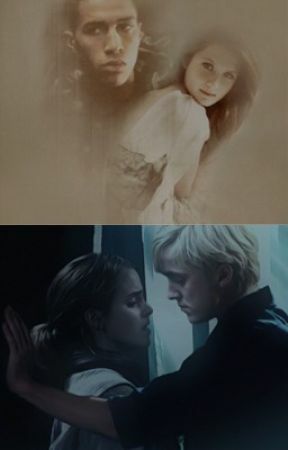 If he comes back tell him I don&apos;t want to see him anymore"
" Hermione stop you don&apos;t mean that" Ginny said and put her hand on her shoulder but Hermione only shook it off.
" The hell I do!" She lowered her wand and disapparated her way out of there and left both Blaise and Ginny in confusion.